It was a rare confluence — the heads of the space agencies for Europe, Canada and Russia, along with senior representatives from the space agencies of India and Japan — all up on the dais together at a hotel in Washington DC, where they were on hand on 22 May to talk about the benefits of international collaboration at the Global Space Exploration Conference. Interestingly, the leader of the space agency whose headquarters is just a few blocks away was not on the stage. That’s because NASA administrator Charles Bolden was in Florida, watching the attempt by SpaceX to send its Dragon capsule to the International Space Station. But perhaps it was somewhat appropriate for NASA to be absent. Increasingly, the agency has had a hard time consummating its joint ventures, and Europe in particular has had to turn elsewhere for partners. NASA has also shifted its exploration goals relative to other nations. While NASA now intends to pursue manned missions to asteroids, representatives of several other space agencies reiterated that the Moon was still squarely in their sights. 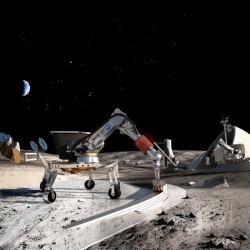 Vladimir Popovkin, the head of Roscosmos, the Russian space agency, said that Russia will pursue extensive, long-lived operations at the Moon’s surface. “We’re not talking about repeating what mankind achieved 40 years ago,” Popovkin said, through a translator. “We’re talking about establishing permanent bases.” Similarly, JAXA, the Japanese Space Agency, issued a clear pronouncement about targeting the Moon. “We are looking at the moon as our next target for human exploraiton,” said Yuichi Yamaura, an associate executive director at JAXA. China was another conspicuously absent member of the aerospace club as represented on stage. Those present were asked whether they should be doing more to collaborate with China. “We’re all for it,” says Popovkin. “We have to talk to China.” Steve MacLean, the president of the Canadian Space Agency, described how impressed he was by China’s space operations after a recent visit. He says it would be “prudent” to explore more collaboration.